Dave Bell's Really Cool Pair Of Jim Dandy's. 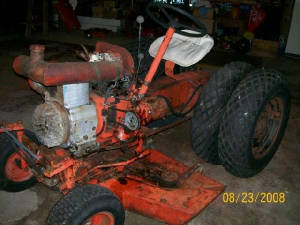 Dave ran accross our site check out his really cool pair of Jim Dandy Tractors.Hopefully he will become a Moto-Messenger and give us the story on these beauty's. 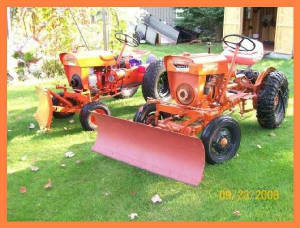 Dave Wrote:I just stumbled on your site and i will certainly bookmark it , It looks like a real neat site , I have sent along a picture of my 67 jim dandy and my 57 power king , these babies run real good and serve me well plowing snow ( Which we had plenty of this winter} I am in kalkaska mi. 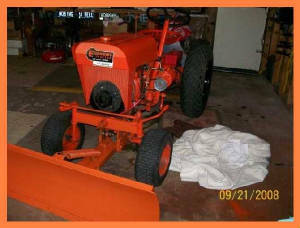 so we get plenty of the white stuff Thanks for letting me in and i will be back DAVE BELL KALKASKA MI. 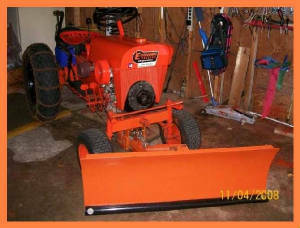 My 67 ready to plow snow,it did a great job.